Intrigue was able to provide all services to our client and presented a visually pleasing website with a powerful and full extendable directory software developed by our senior development team. The client has been using the software efficiently and consistently without issue and has built their directory to be one of the best on the Internet. 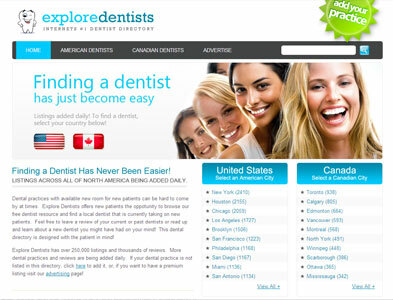 If you are seeking a dentist in your community, search www.exploredentists.com.